Market Deeping celebrate as Ashley Fisher (left) has just dimissed Bourne star Peter Morgan. Photo: Tim Wilson. Heavy rain ruined the eagerly-anticipated derby match between Bourne and Market Deeping in the Lincs Premier Division yesterday (June 25). The home side had recoverd from 25-4 to 111-6 at the Abbey Lawns when play was halted. Lee Peacock (3-42 from 17 overs) had continued his decent recent form for Deeping, while Ashley Fisher picked up the prize wicket of Bourne skipper Peter Morgan for just one. Fisher returned figures of 2-14 from seven overs. 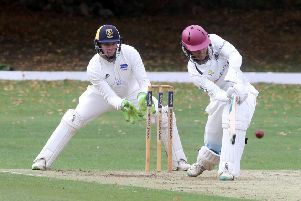 Rober Dunn (31no), Robert Bentley (26) and Ben Collins (20) had led the Bourne fightback. Deeping drop one place to third in the table following Lincoln’s win yesterday. Bourne remain in eighth place. Bowling: L. Peacock 17-6-42-3; A. Fisher 7-0-14-2; M. Adatia 2-1-4-0; Z. Simmonds 11-4-25-1; A. Sharp 3-0-22-0.